February :: 2013 :: Oracibo.com - Food, Travel, Design and Cooking! I know, you are thinking, here she goes again with another one of those rants! Well, it’s just not right. It seems that almost everyone owns a dog or two these days and good on them. My problem is those owners who refuse to pick up their refuse! Do you think it’s fair that they should walk their dogs in your neighbourhood and let their blameless little pooch use the “big outdoor toilet” and then not take the time to scoop the poop? I mean, I have read stories about Paris and their pooch poop problem but it seems to be getting pretty bad around here. If you go out when it’s dark I would recommend using a really good flashlight to navigate your way! Now when I go out I’m like a bloodhound, searching in front of me for the offending stuff. Last week when I took the empties out, there was a pile of the stuff right in front of the dumpster. I mean…come on people. Now, whenever I see someone walking their dog, I look to see if they are carrying a plastic bag! My Uncle told me a story about a neighbour of his that walked his dog past my Uncle’s house every day, leaving a nice mound on the lawn. Well, said Uncle finally got p.o.’d and decided to collect the offending stuff for a few days. He then went to the offending dog owner’s house, knocked on the door and when the guy opened the door, my Uncle handed him the bag of poo saying “here, I think you forgot something”. That seemed to do the job. Does this mean we will have to be out in the dark on patrol? Come on…think about your neighbours and their shoes will ya? I mean yucky! Just heard that song again! I used to babysit for a couple who could get the Jack Paar show on their TV. As we were unable to receive it at our house, I looked forward to babysitting their children and having the chance to watch the Paar show and see the famous, infamous and quirky guests he seemed to attract. Even Senator John F. Kennedy appeared on the show when he was a Presidential candidate. Great guests! Loved that show! Oscar Levant was a regular visitor. One night, after Jack & Oscar exchanged some witty repartee, Jack asked Oscar to play “Blame It On My Youth” on the piano and even though he was only able to play a part of the song, it has stayed with me. If you are not familiar with this beautifully written song, co-written by Oscar Levant and Edward Heyman in 1934, you are really missing out on a wonderful piece of music. Hmm…maybe this was the very beginning of my love for Jazz? Not until some time much later did I hear the entire song. 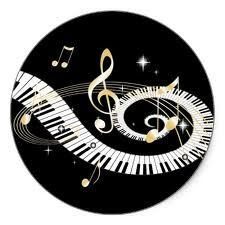 It has been “covered” by Jane Monheit in an album she recorded a couple of years ago, (check it out on YouTube) ,Chet Baker, Karrin Allyson, Kurt Elling and Jamie Cullum to name a few. The lyrics are beautiful but seem sort of sad to me. It’s really high on my “songs to take to a desert island.” I always crank up the volume to listen to it! One of the “ Treasures” of London. We decided that a visit to Smithfield was in order. First on our list, St.Bartholomew-The-Great. 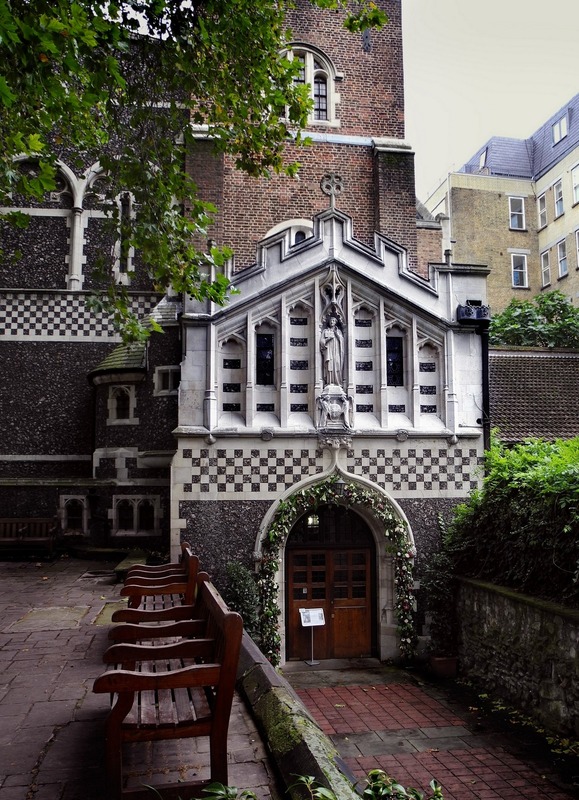 It’s supposed to be either the oldest church or one of the oldest churches in London founded in 1123. St. Bart’s is really special. It’s charming and we loved it! The church barely escaped the Great Fire of 1666. 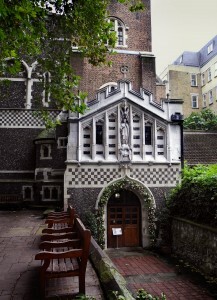 William Hogarth, the painter, (The Rake’s Progress among many others), was baptized here in 1697. We were fortunate enough to be among only a handful of visitors that morning so the man at the door spent time telling us the history of the church and the surrounding area, including “The Golden Boy of Pye Corner,” aka “The Fat Boy”. The statue marks where the Great Fire of 1666 stopped. The plaque below the statue is rather interesting. “This boy is in memory put up for the late fire of London, occasion’d by the sin of gluttony!” Just around the corner from St. Bart’s is the St. Bartholomew Hospital that still bears the damage of bombs dropped in Zepplin raids during W.W. I and during the Blitz in W.W. II. He also pointed out an Elizabethan house, just behind the church that is the oldest, continuously lived in house in London. An interesting neighbourhood! The old Smithfield Meat Market is nearby too. You might be interested to know that St. Bart’s is a bit of a “star” itself. It has hosted many film crews, including: Four Weddings and a Funeral (1994), Sherlock Holmes (2009), The Other Boleyn Girl (2008), Elizabeth: The Golden Age (2007), Amazing Grace (2006), Shakespeare In Love (1998) and Jude (1996). So, you just may have seen St. Bart’s already! It’s crumbling a bit here and there, otherwise in pretty good shape considering! There is the Cloister Café in the 15th century cloister that seems to have “a good selection of fine wines, monastic beers, excellent coffee and delicious food.” You gotta love it when a church has a café that sells booze. None of that here in Vancouver, we just couldn’t be trusted! Hopefully the funds raised from filming and the café will keep things in good repair. It’s a pretty special place.